US secretary of state tells lawmakers in Washington that international law already recognizes Israel as a Jewish state. ‪Saudi Foreign Minister Prince Saud Al-Faisal bin Abdulaziz al-Saud,. Secretary of State John Kerry told members of Congress on Thursday that international law already declares Israel a Jewish state, and called Prime Minister Benyamin Netanyahu’s insistence on a public declaration of Israel’s Jewish character from the Palestinians “a mistake” in the diplomatic process. “I think its a mistake for some people to be raising it again and again as the critical decider of their attitude toward the possibility of a state, and peace, and we’ve obviously made that clear,” Kerry told the House Foreign Relations Committee, in a hearing on budget matters. Yesterday, Kerry told a Senate panel that Israel and the Palestinians had less trust in one another than at any point in over nine months of negotiations. Netanyahu has said that the PLO’s public recognition of Israel as a Jewish state is a “minimal requirement for peace,” and considers the issue fundamental to the conflict: Arab refusal to accept a permanent Jewish presence in the region. I will advice all who read this, to be careful calling anyone stupid. Very few people are. But a lot of people are double faced, and some are outright evil. 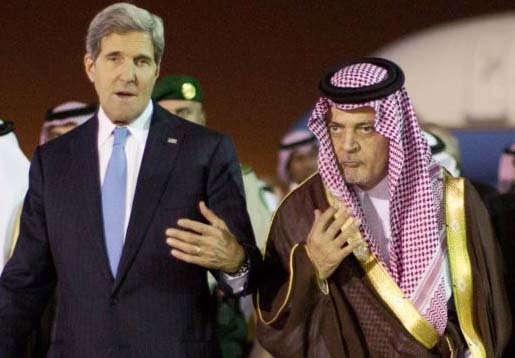 Nevertheless, it is difficult to avoid calling John Kerry stupid. I want to remind the reader about the USA, having neighbors who accept its borders, and that the Federal stat has a right to exist. It would be unthinkable to see a man like Kerry accepting that the people in Toronto, have a birthright to fire 50 rockets or so into the Chicago-area. And still not demeaning that the parliament in Ottawa must enforce the people in Toronto to recognize the USA, before any deals can be done between Washington D.C and the Canadian authorities. But no so, when the troubled nation is Israel. The Jewish state shall live in some kind of suspended animation, and tolerate what the Americans would not tolerate. Not even for a split second. Now, you decided if John Kerr is an outright man of evil, double faced, or juts stupid. I have not come to my final conclusion. Not yet. There can be absolutely no doubt about it…Jerusalem has become a heavy burdensome stone, which will become worse until the return of our LORD and real Yeshua HaMaschiah Ben Elohim. This is clearly an attempt by Kerry to strip away any requirement for the Arabs/Pals to give up their claim to all the land of Israel “from the river to the sea”, as they like to put it. He is trying to disconnect from the need for Arabs/Pals to give up that demand in order for peace to be achieved. This isn’t stupidity. This is pure evil. This is Kerry telling the Israelis to give their mortal enemies everything that comes with a peace deal, whilst they continue to openly work toward Israel’s destruction. The Israelis should tell him to stick his deal where the sun don’t shine! Then take back full control of Judea, Samaria, and Gaza. The One State Solution! It’s all about appeasing the bully. So sad and pathetic, and-yes-STUPID. Kerry’s got Putin to worry about now. Hebrews Chapter Eleven take them for an example for your. Faith and not wavor..